This image, taken by NASA's Hubble Space Telescope, shows five moons orbiting Pluto. Almost exactly one year after discovering dwarf planet Pluto's fourth moon - though not before actually naming poor little P4 - NASA announced Wednesday a fifth moon has been discovered orbiting the ex-planet. Astronomers using the Hubble Space Telescope found the irregularly shaped moon, which they said measures 6 to 15 miles across. For now, it's being called P5. "The moons form a series of neatly nested orbits, a bit like Russian dolls," said Mark Showalter of the SETI Institute in a statement released by the European Space Agency. Showalter is the leader of the scientific team that discovered the new moon. The moon was detected in nine separate sets of images taken by Hubble's Wide Field Camera 3 on June 26, 27 and 29, and July 7 and 9, NASA says. 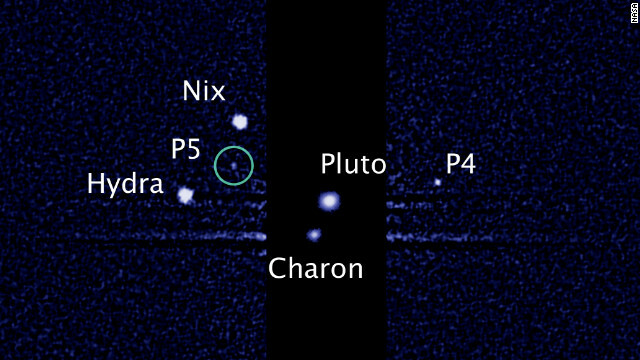 Pluto's other moons are Charon, Nix and Hydra. The team at SETI Institute is "intrigued" that Pluto, deemed unworthy of planethood in 2006, could have "such a complex collection of satellites," the statement said. The leading theory is that all the moons are remnants of a collision billions of years ago between Pluto and another large object from the Kuiper Belt - the region of the solar system beyond Neptune. Because Pluto is so far away from Earth, the images of P5 look like small white dots. But a NASA spacecraft that is on its way to Pluto will give scientists better images and details about the former planet and its neighbors. The New Horizons spacecraft was launched in 2006, just months before Pluto was demoted by the International Astronomical Union, and is now about halfway to the icy dwarf planet. It's due to fly past in July 2015. Hubble is on a scouting mission in support of the spacecraft, and is providing valuable information to guide its flight. "All of this stuff poses a navigation hazard for New Horizons," said Ray Villard, news director for the Space Telescope Science Institute, which operates Hubble's science mission. "It's a messy place. You have moons and perhaps small particles." Hubble, launched into orbit in 1990, received new instruments in 2009. "It's at the peak of its performance," Villard said. Hubble is expected to remain operational through the end of the decade. The James Webb Space Telescope, slated for launch in 2018, will have a larger mirror and will study Pluto after the New Horizons mission. "Finding this moon was exciting and shows us Pluto is an intriguing and complicated place," Villard told CNN. Mainly because one doesn‘s love you fascination with this occupation long for them that will,doesn‘s convey that they preceptor‘s love you system they need. Yeesh... All those moons, and they still say Pluto is not a planet. What WILL it take? Excellent article! Pluto has been bilowng up my 2nd house since 2004 but the cappy transit has put an exclamation point on every thing material/financial. I do see and feel the transformation. I am embarking on a new career, one that is my calling. Taking a huge risk but it's time Thanks for your amazing insight! Pluto is my best friend! What is and what isn^t a planet look up UFO over Jacksonville, Fla June 1971 or 72 and what your take on planet and Moon other solar system. It's Tom Cruise's shuttle...it's almost here. In the vastness of the universe, anything possible, however improbable, probably does exist somewhere. That means that somewhere in the cosmos, there is a civilization in the infancy of its space age about to be invaded by an alien race whose presence was first revealed by the appearance of their fleet in orbit of the innermost large Kuiper Belt object, where it was mistaken for a new moon of that object. The odds of this happening to us are still infinitesimal. Pluto is still a planet by definition, its just now considered a dwarf planet. . I dont know why the dwarf sub-classification bugs people. Its like classifying a small person as a dwarf person. They are still a person, one is just being more specific with the sub-classification. Had they not altered the definition of a planet, then there are 100s-1000s of planets in our solar system. While technically having 1000 planets is not a problem, its also not very specific. When one has too many objects in a category its useful to break them down by similarities into more specific categories. And that's what they have done. Even planet and dwarf planet is not good enough...as there are 100s-1000s of dwarf planets in our solar system. We've found 5 so far, but the odds are extremely good there are at least 100s, they are just very hard to find. When we start finding 100s of these things, we are going to have to further sub-classify them. The biggest problem i have with the current definition of planet and dwarf planet is if we find a large object in the kupiter belt–say the size of mars–it would be defined as a dwarf planet, and it shouldn't be in my opinion. I'll accept pluto's a dwarf planet or whatever they want to call it only and ONLY when the FULL IAU votes on it. Not the 424 who hijacked the debate out of 2700 attending members of the IAU meeting. These corrupt people waited until the very end of the 10 day meeting and when most people were gone held a vote and had pluto demoted. This is NOT how votes are supposed to be held on something so many people hold dear to their hearts. Full vote or It's a Planet. Sorry It was 10,000 members attending the IAU meeting. Rather than restrict such matters to the IAU, why don't we decide scientific controversies based on a vote among the general populace? – UFOs exist and are visitors from other planets bent on conducting obscure experiments on undereducated ruralites. – Bigfoot is somehow in cahoots with the UFO aliens. – There is no acceptable evidence of the Big Bang. – The sun orbits the earth once every 24 hours. It's still a planet. I don't care what they say. No, seriously. Our galactic overlords will arrive any day. Pray to whatever god you believe in, and prepare yourselves accordingly. Finally news worth reading about. Enough of Tomkat divorce! God says it's a planet. End of story. I used to have an imaginary friend too. Science – especially astronomy – is just wonderful because of all the new discoveries made daily. The number of exoplanets is now over 700 (or more since I started writing this.) Back in February I was fortunate enough to spend a couple hours with Neil Degrasse Tyson at his seminar in Boulder, Colorado. We talked excitedly about the amount of exoplanets being discovered and how we luck out when the planet transits its star so its atmosphere can be analyzed. As you likely know most are found due to the wobble they impart to their sun, not because we see them transit. I can't wait for the New Horizons craft to reach Pluto in 2015, who knows what we'll discover then. Name P4 "Donald" and P5 "Goofy". Attended show in Orlando last night. Had mixed feelings about the show and the rsaoen is because of the lighting and sound. First of all, there was a very glaring white light shining from the back of the stage right onto the audience. It made it almost impossible to see the stage. Also with all the other lighting it was easier to see the dancers on the projections screens rather than on stage. Very difficult to make out which dancer was which. The volume of the music and even the videos of Mary and Nigel was almost deafening. It seemed as though the sound and lighting people didn't have time to set up properly or check their work.The performers were so good that it made sitting through the above worthwhile. They're probably the best contestants So You Think You Can Dance has had so far. Hope the troupe will be in the Orlando area next year. The fifth moon - tentatively named after the Greek God Phallus - because of its extraneous position and unstable rotation, is likely to de-orbit and go plummeting into Uranus. For none believer a Spaceship travel in deep space is like a person in a pit black room after spinning around several time and stop he would be moving and yet standing still that how slow it appears a deep spaceship is traveling. There are so many errors that I don't know where to begin. It's a named planet. It has moons, and a long (sorta long) history as being considered a planet. It can be seen from powerful Earth telescopes. IT IS A PLANET. sorry guys but its a dawrf planet, live with it. Thing is, a minor planet or dwarf planet is still a planet. Pluto isn't a moon or asteroid. Keep in mind that Pluto has long been seen from Earth. The others you mention, not so much. Pluto was discovered in 1930 (no electronics, old school optical), It's biggest moon was discovered in 1970's. The other two minor/dwarf planets you mention were not discovered until after 2000 (all electronics, no visible). The technology gap between 1930 and 2003 is massive. If they want to add a couple of planets, so be it. But Pluto was well established as a planet. Strange strange indeed I can look down in a crater on a full moon with a 7×42 Canon binocular but we cannot see the moon lander at the same see a fifteen mi. rock across circle Pluto. Something wrong with my picture. Yea, tens of thousands of people are all involved in a conspiracy faking the moon landings. This really gets old. Surprised you even have a telescope. That would have just a little bit to due with the incredible difference in distance... you need to check out how much further away Pluto is than our moon. Things look smaller the further they are from you. The most powerful telescope on Earth might be able to see a speck on the moon that is the lander. But it would be litterally like a single grain of sand in a picture of the entire beach. Pluto is very far away. VERY FAR AWAY. It takes light a long time to get here from there. I doubt we have any telescopes on the Earth big enough to even see it as a speck. use your same binocs to look at someone standing 5 feet away from you and tell me how clear you can get the image. You are about as bright as Pluto. The study of the universe just blows my mind. Nine years for a space shuttle to arrive at a planet? Unfathomable. Even better, a spacecraft is launched on a mission to a planet, and by the time it gets there, it's not a planet anymore! People who don't believe in the 5th moon of Pluto are the same as Global warming deniers. That 5th moon, that CNN has idiscovered on 07122012, is the cause of all our problems, – in the history of the planet pluto never have they had this 5th moon, to throw off the equillibrium of the fragile pluto atmosphere- if CNN had no brought this moon into existence this problem would not exist. Only solution is to send me money, lots of money I will – raise awareness and safe pluto. If you don't agree – your a holocaust denier. Astronomers at the Sarah Palin Galactic Obsevatory / Bait Shop were eager to photograph this new moon but Sarah Palin forgot to take the lens cap off. That's no moon...it's a space station. Why not land on Pluto and use it as our outer orbit observation outpost? OOOO! Because it's not any better than a space bound scope. Pluto does have a very thin atmosphere so any kind of optical device would be wasted. Any change in the parallax is not really any help either since the distances to most stars are still too far to be helped by this "larger" baseline. Well, Pluto's atmosphere is 0.3p and only exists for about 20 years prior and after it's orbit brings it past the orbit of Neptune. Pluto will only have an atmosphere for about another 8 years before it freezes and falls back to the surface. The New Horizon's space probe will be there in 2016, so we'll finally get to see what it really looks like, analyze it's extremely thin atmosphere and how many moons it really has. I'm gonna guess it has well over 10 and we can only see 5 of them. Also, it's too far away to be used as any kind of outpost. That's scifi and will be for at least another 1,000 years at minimum, if ever. Can a moon(s) orbit a non-planet? Even some asteroids have moons. Yes, moons have been discovered around asteroids. Any small body that orbits a larger body is a moon. Of course the definitions are a bit murky. I use the size relationship of the Earth/Moon for my own cut off point between a moon and a binary system. Just my own measure, not standard at all. Speaking of murky definitions, "planet" has no locked down definition either. The prevailing distinction between a planet-moon system and a binary planet is the location of the center of mass. If it's within the larger body, the smaller body is a moon. If it's outside and between both bodies, the two bodies are members of a binary or double planet (or dwarf planet, in this case) system. Exactly. A dwarf human is still a human. Same with dwarf stars. They are still stars. So it's a planet. lol, stretching a bit there with the analogy. December 27, 2010 – According to the Russian Pravda news, the SETI, a non-commercial organization said that the largest one of the three spaceships is 240 kilometers wide, and the two others are smaller. According to the SETI researchers the objects are nothing but extraterrestrial spaceships, and will be visible in optical telescopes as soon as they reach Mars' orbit, reported the Pravda news. Of course it's true! And we will greet them with our black helicopter fleet when they arrive. They are coming to see what happened to their people who crashed at Roswell and are still being held captive at Area 51 where they're forced to design top secret weapons for the government. When the fleet gets here in December they will naturally initiate the destruction of Earth as prophesied in the Mayan calender. lol Blue Beam and HAARP is by far my favorite conspiracy theory. Wouldn't it be AWESOME if the aliens showed up DUIRNG the light show? LOL how would something designed to study Northern Lights detect spacecraft beyond Plutos orbit? I just dont think you understand the distances involved here, We so dont have the sensors to detect even large objects that far out, hence just discovering another moon orbiting Pluto. Pluto and its neighboring stones are not moons or explanets. They are exrocs or better know throughout the universe as Herding Asteroids. These Herding Asteroids change their orbit to intercept stray rocks and particles from getting into the the inner planet orbits and crashing to planetoids like Earth and dstroying life. Most galaxies have these types of asteroids that sweep up particles and good size rocks. Sounds pretty silly doesn't it! Well it's just a theory! "Most galaxies have these types of asteroids"??? That must be one gigantic telescope you have! I think they should name it Keith. Amazing that Hubble can see something 15 miles across at that distance. "Pluto and the Ex-Planets"... what a great name for a band! It appears DiskMonTools reads 16200 bytes. I'm guisseng the author picked this arbitrarily to make sure he gets all 11 sectors. I notice if you get the Track Info that a few sectors come up twice, and guess that's to make sure they get all complete sectors. There are so many white dots on picture,,,,,,,,,,,,,,,,,,,,,,,Why is that dot a moon while others are not ??????????? The entire series of pictures would show that some of the dots are stationary background stars, and those identified as "moons" move with and around Pluto. Them scientist fellers are pretty smart. Why is this important ?????????????????????????????? Science and research are the keys to our future ObamaJoe. That device you used to type your message and post on the internet for all to see were created by people who had the insight to know how important this is. Sadly, you do not. Dan, one could also take a slightly more pragmatic approach to answering that question. For example, we could take our tax dollars and just give it to people to sit around on their couches and watch TV, or we could spend it to create jobs and the human race could expand it's knowledge of the universe in which we live at the same time. Inasmuch as the former 'plan' eventually results in the total extermination of the species as our solar system nears its end of life and the latter actually gives the species a chance for continued existence, I prefer the latter approach myself. It is important so you have a chance to criticize the President and the current administration. After all, your life must have some meaning. I guess if your interest don't go past video games and reality TV not much would seem in portent to you, would it? You ask why it's important, yet you had enough curiosity to read the article AND make a comment. It's about wondering what's out there, exploring the unknown and finding answers to everyday challenges. It can be as simple as that. If you need to ask about this stuff, please just focus on your day job and let the scientists do their thing. If it wasn't for science, you'd still be rubbing sticks together for fire or hoping a lighting strike happens near by and the shrubs are still burning so you can cook and stay warm. Get it? Some large alien space cruiser compresses and empties out its lavatory waste tank in orbit around Pluto and everybody gets excited – that moon is a big pile of you-know-what! Correctamundo! Both P4 and P5 have been verified to consist of frozen poo, which is why they're named P(number). Nix, Hydra and Charon are bina fide stellar objects. Five moons? That's a planet right there! hey! I got dibbs on P5! That moon is mine! All mine! So everyone keep yer greedy mitts offa my moon! It's actually easier to get info about the early universe than to see a small moon at the edge of the solar system. The early universe is studied from the CMB (the Cosmic Microwave Background), which is the sort of like the afterimage of the Big Bang. It is literally all around us, more or less everywhere in space since the universe was "born" everywhere. You can see effects of the CMB on a TV with a radio antenna; a small percentage of the static on an unused channel is actually from this background radiation! So it's much easier to see than some little rock that's a couple billion miles away. there should have been some means of acidgwlenokng who was dancing in new numbers. My friend was gushing over how well Marko did with Melanie in the Broadway number and was surprised when I told her it was actually Jess. These dancers deserve at least a moment or two of audience appreciation all of them. I did like the blending of dances into a more theatrical experience, but did not like the new pair coming out before one pair finished. Again, no chance to applaud. We were smitten by Ricky and Jess, even though we went in as girl-focused favorites. Those two were phenomenal, esp. Energizer Bunny Jess. Overall, great show. The Webb telescope is horribly over budget and may never get launched. Like the infrastructure of the US, our space infrastructure is also in decay. It's not a moon, it's the alien spacecraft rumored to lie in the area of Pluto that is heading our way in time for Dec. 21, 2012. You heard it here. Well, there you go. It was on the internet so it must be true! Not that I wouldn't think it was cool for ships to actually arrive. It would be the greatest event in human history, even if they did come to put us on their dinner plates. LOVED IT!! Went to the show tonight in Toronto, Canada. It was the best show ever. By the 2nd show I saw I was getntig bored, the Canadian version was even more boring than the US one. I was really impressed with how you had each dance blend into the next. Incorporating dances that other contestants danced by having 2 of the dancers on tour perform it was great! I'm sad that I didn't get to see Missy dance as she was injured, but I was extremley happy to see Nick perform. I always thought that he was eliminated too early.The best part of the night was Ricky, he was amazing! He performed 3 dances that were originally performed by All Stars. He did just as good a job as them, he really out-did himself! Way to go Ricky!! Don't forget your tinfoil hat. Fourth moon. Since the Pluto-Charon barycenter lies outside the physical bodies of either, the two qualify as a binary dwarf planet. Pluto: proof that size does matter. what can I even say about a "science" article that begins 'Almost exactly'? It's probably about all you can understand. Obviously that little thing kept you from reading it. It makes little sense to complain about it, since it's probably over your head, anyway. more obvious: over your head. To a scientist there is no such thing as "almost exactly". it can be almost (i.e. within epsilon) or it can be exact. now get back to homeroom before you're marked absent. I couldn't agree with you more. I started to chuckle the moment I read those first two words. Get over yourself. There is *no such thing* as "almost exactly," period...that's just the way English works. But languages are also full of nonsensical idioms, and most of us just accept it. You're trying to be clever and trying to make this somehow particularly offensive to scientists. What's wrong? Couldn't find anything else to criticize? Had to go all-out for an opportunity to sound smart? You must be a hoot at parties. We must accept that "science" articles on general-audience Web sites are generally not written by or for scientists. We must also accept that any article on a general-audience Web site is generally not written by the greatest of writers. Depressing. The articles most available and most comprehensible to the general audience are almost designed to perpetuate and amplify ignorance. The tin-foil hat is beginning to seem appropriate. To say we're disappointed the tour isn't sceedulhd to come to Portland this year (or anywhere in the Northwest for that matter) is a HUGE understatement. Unless you graciously add a stop here, it will be the first SYTYCD tour we will have ever missed. Dramatic as it may seem, I really feel heartbroken to miss it. SYTYCD is so much more than just entertainment to the masses, and inspiration to the dancer inside us all. It is the most phenomenal exhibition of living art that lets all of us breath the greatest emotional depth human souls can share. Please, oh please can you reconsider your avoidance of the Northwest this tour and come? Your fans here would so appreciate it. And in another news, I just discovered a big rock in my garden. just one? You should see the pile I dug out of MY garden. You should hide it or get it patented in your name before NASA claims that it discovered the pile on earth and comes to your door to claim it. I love this. First, the numbskulls at the Int'l. Astronomical Union, with complete ignorance of the most basic tenants of PR, declass Pluto. Ultimately we learn that this small planet has 5 moons. Sweet Justice. So I guess that means you consider Eros, a large asteroid which has a small moon Ida orbiting it to be a fully fledged planet. Eros may be an ugly pockmarked 20 mile long peanut but it has as many moons as Earth does making it a truely mighty world! Plus, it's an Earth crosser! why is it sweet justice? you didnt actually explain that part, as if somehow you think this means that the classification of dwarf planet is incorrect. They wouldn't know the damn moon if she looked them in the eye. Blind bats. So any chunk of rock in orbit around a non-planet is a moon? Not sure where to draw the line. Nothing formal, but many astronomers seem to recognize a threshold of about a kilometer. If any piece of rock or ice large enough to be seen could be called a "moon," Saturn and the other gas giants have _billions_ of moons in their ring systems. Wouldn't it be something if they found that Pluto had a ring of it's own? Well, I'm not quite sure that the P5 is Pluto's moon for it looks dim and small. Visibly, it seems to stay far from the others. We see it is orbiting the Pluto, but whether it's possible that its orbit actually keeps the distance from Pluto? The reason it looks like a small dot is that according to the article it is 6-15 miles wide. Pluto by comparison is approximately 1500 miles wide. Less surface area = less reflective area. Notice that the article says, "The moon was detected in nine separate sets of images." They've been watching it a while and they can tell exactly how it orbits. An "ex-planet"? Will we soon be an "ex-planet" also? In a few billion years. Give or take. Not at the rate we're going right now. Maybe 100? Yes. Yeah, I think your right. Full reverse! Chewie, lock in the auxiliary power. I can't! They're pulling us in! I gotta shut down! They're not gonna take me without a fight! It's the theorized "God" moon! I attended the show in Chicago (Allstate Arena) on Wednesday this week. The danecrs did an admirable job and where very enjoyable to watch perform. However, I was gravely disappointed with the utterly horrible production. The sound was so bad I almost left early. To say it was unlistenable would be a kindness. All of the material was per-recorded and sound quality should have been flawless, but it was dreadful. As deplorable as the sound was, lighting was a close second. Lighting design did not take the audience into account. The backlighting over powered everything else leaving the danecrs in silhouette. Given the high quality of the TV show I was surprised that the owners/producers of the So You Think You Can Dance would allow themselves to be associated with such an amateurish effort. If anyone evolved with the show where to experience the night I attended they would fire the FOH engineer and lighting designer on the spot. I can only hope that these issues are resolved for the balance of the tour. Well I hope Neil deGrasse Tyson is happy he unlisted Pluto as a planet and made children cry now. The best option would have been to use Pluto as the minimum size and dynamics for planetary status. This would have set a quantifiable limitation for planet / dwarf,minor planet, KBO or TNO status. But if we call Pluto a planet because of its size, we would also have to call about four things in the main asteroid belt "planets," and we would also have to call a handfull of moons, including Earth's Moon, "planets." As she said last night, "Size does matter", much to my dismay and disappointment. Nasa discovered a 5th planet around dwarf planet Pluto and they don't know what to name it? Obviously they need to find the other 2 and name them all Sleepy, Sneezy, Dopey, Doc, Happy, Grumpy and Bashful. Please don't list your password in the post (Sneezy, Sleepy, Dopey, Happy, Bashful, Grumpy and Doc). I know you were told to make it 7 characters that you can remember but I think they meant letters from the alphabet. For some reason this is really much interesting than watching politics. Definitely much more intelligent than politics!! And much more useful to mankind. Glad to see so many people interested. Usually you just get a bunch of wastes of life complaining that space exploration is all just a waste of money. Such short-sighted ignorant people infuriate me to no end. Space exploration is important to all of us, whether or not people realize it. Plus, it's just cool. I agree with you. It is quite interesting too. But, I always have this question that we are spending billions of $ on sending scientists/robots on moon/mars and trying to discover the soil, atmosphere etc. What is the aim for doing all these? Discovery! It is good for its own sake, and every once in a while, it leads to something useful. We wouldn't have cell phones today if it wasn't for Project Apollo. However, this project also had positive results. Just because they can see something the size of a baseball orbiting something that has been deemed unqualified as a planet does not make it a moon! At one time the definition of a moon was anything natural that is in an orbit around another body. Technically every object in the rings of Saturn is a moon, however because of Saturn's rings, it was decided informally that the object must be I believe it is 1000 feet across to qualify. I doubt they will ever come to pass, but a few thing I keep hoping for from the GA\'s:1: Give us the sahrigtt scoop on some of the controversial stuff from our past, ie. polygamy.2: Get real on the W of W. Start stressing more of the stuff that actually kills people like obesity and sedentary life styles. To my knowledge no one ever died from drinking tea, but it can keep you out of the temple. Never had any, but it can actually be good for you.3: In the town I live in some people think this is evidence I may be the anti-christ: Time to dump the scouting program as the official activity of the AP. We could do so much better in-house. And since I\'m thinking big- going to a 2 hour block would be nice. My daughter and I went to oepning night of the tour in Orlando, we had floor seats about 7 rows back. I can understand the comments about the lighting but from our seats it wasn't that bad. We LOVED the shows format, very little talking and a whole lot of fantastic dancing! We have been to all tour shows and this was definitely the best. We loved all the previous shows but this year's kicked it up a notch and seemed more like a Broadway production.Cons- the dancers came out after the show for pics and autographs quicker than before but that meant more people were still waiting. Also, the dancers were shuffled around in no orderly fashion and didn't stay out long. Actually yes - yes, it does. I'm no expert on sports, but I had no idea a baseball was 6 to 15 miles across. Those pitchers are much bigger than they look. LOL.... I was thinking the same thing. Knock it outta da park! I see that bad moon a-rising..
That's not a moon, it's a space station..
What ever happened to Goofy? So is your comment !!!. Zacharia's interpretations were his own. Where are these texts he translated now? .. Who other than him has translated them? .. I want to know because Ceuniform text is the oldest text around written by the Sumerians, and I personally think if they knew anything it would be in those texts, and not exaggerated by the late Mr. Sitchin. Saw the show in Georgia last night. Bright, glaring litghs low at back of stage blasting the audience in the eyes made watching the actual performers completely impossible. Where did these people get their ideas about lighting? Absolutely ridiculous, but something that can be easily corrected. Until they fix this problem, I would not encourage anyone going to the show. What I could see of the dancers (often only on the projection screens) showed how absolutely fantastic they are. Too bad the production company is in a totally different class. Also, the bass was WAY too loud. Focus should be on the dancers, not the disabling litghs and over the top sound volume. The Sumerians described Pluto as a planet in their texts, so why did it loose its status as a planet in the first place? Want to know more, read the 12th Planet by Zecharia Sitchin! lose not loose. also no suggested reading please. Sumarians could not have seen Pluto. It takes a really powerful telescope to see it. how can the Sumaryians know about Pluto? Even Neptune – which is usually closer the Pluto and thousands of times bigger then pluto – is not visible with the naked eye without a telescope. The parallax needed to identify it as a planet would have taken centuries of studies with the naked eye. Secondly, even if they did, I don't think Sumariyans knew about the relative sizes of other planets or the structure of Solar System, in order to differentiate planets from dwarf planets and asteroids. the sumerians never saw pluto. That is a 'Mickey Mouse' argument.....they simply flew by it as they were colonizing this rock! My sister and I are fans of the show and love to dance. We apcetpiare the music and the dance and we were soooo excited to go see the show live in Orlando. I can't stress enough how mad I was by being blinded by the big bright white light, not just for sporadic moments, but for several dances and long periods of time. I was sitting on the first row above de floor seats, diagonaly from the stage. We had to watch the screen instead of them live. PLEASE, PLEASE, take that big blinding white light out from behind the dancers and let the people that haven't gone to the show enjoy what I couldn't.I loved every dance I was able to see, and like other people, Melany made me cry . again! !Can't wait for next season. CNN this is not just a NASA telescope. It`s operated by ESA as well. ESA invests a lot of money in it`s operations. The replacement James Webb will also have many components from ESA. In fact the James Webb will even be launched by Europe on their Ariane 5 Rocket. If you claim to be a quality international news channel it would be nice if you gave some more facts. How about Mickey and Minnie for P4 and P 5? Find 2 more and name them Sneezy, Sleepy, Dopey, Happy, Bashful, Grumpy and Doc! Pluto is a dwarf, after all. Wow, a telescope that can see something that is only 15 miles across at a distance of about 3B miles away that is not emitting light of its own and illuminated with very little light at that. I can't read the newspaper without glasses. I wonder if it can see one of the flags we left on the moon? They don't really "see" the moons. They detect light signal changes as they oculate a star. As for our moon, there was a reflector left on one of the missions and a telescope pointed directly at it and send out a laser through its optics and see the signal return. P5 was not discovered via an occultation. It was discovered by imaging the moon. The image published with the article is of sunlight reflecting off of pluto and it's moons. A resolution of .1 arcsec at the distance of the moon works out to a resolution of about 640 feet. The hubble wouldn't come close to seeing anything we left on the moon. But Clementine (in orbit around the moon) has. Google it. Hubble really isn't very big in terms of telescope size, especially compared to Earth based telescopes. It just doesn't have to look through the atmosphere, and so gets the sharpest pictures for a scope of its size. What I find interesting about the behavior of light is.. is the faintness due to the lack of photons entering the lens? .. You would think that there would be some intermittent "flashes" in the picture because of the lack of photons (if they were particles) while trying to observe such a faint object. If photons are particles, you would see pluto blink in and out of sight due to the gaps in linear streaming from the object that's reflecting the light. I think that light is has more secrets to it than you think and that of which the current best have to understand. Telescopes don't work that way. Unlike terrestrial binoculars, their main goal is not to zoom into things (maybe a little bit, very rarely), but rather, to collect more light to see things that are almost dark to our eyes. Even today, the sizes of astronomical objects images through backyard professional telescopes and largest of observatories are the same size. Even a majority of Hubble Images show the moon at only a few times the magnification, not mush larger than what but is extremely high contrast (compared to even backyard telescopes getting dozens of times more magnification on cost of extremely poor details). So even at the max, Hubble cannot resolve areas larger than 300 metres on moon's surface, definitely not the flag. Pluto and its moons are only visible because Hubble can identify their light which is millions of times fainter than what our eyes can identify. The magnification is still just a few hundred times improvement on what our eyes would see. Five moons around and Pluto not considered a planet? A truly misunderstood PLANET!! 5 balls of ice spinning around each other at the edge of the solar system do not a planet make. Like Jerry said – Pluto will always be a planet. Just a "minor planet" like the 4 or so redently discovered way farther out in the Kuiper Belt (and some bigger than Pluto probably with many satellite moons as well). What is YOUR requirement to be called a planet? Being round? Having satellites? Check out Ceres and Eris. They both may fit your requirements too. Cool stuff out there. Yeah really, you would think. I say Pluto is our coolest planet...pun intended. It's actually a party to cheer up Pluto after its demotion from planet. Didn't you get an invite? I've wondered why can't Hubble somehow be attached to the ISS? Are the orbits different? I realize with the retirement of the Shuttles this is probably impossible, but if it were to be attached it could be serviced on a regular basis. Yes, they are on COMPLETELY different orbits. And nothing we currently have (including the former Space Shuttle) could change Hubble's orbit to the same as ISS. Hubble was placed on a much higher orbit than other Low Earth Orbit (LEO) sattelites, including the ISS, on _purpose_. The point was to keep it out of the way of other sattelites, and to keep other sattelites out if its way. Imagine the degradation of Hubble's capabilities if a waste dump from the ISS fouled its main mirror! No, Hubble is in a hard-to-reach place for good reason. Doesn't the term "moon" denote a satellite of a planet? Stop calling me a "dwarf" planet or I'll kick your butts. I saw the show last night at the Agganis in Boston. We paid a decent amunot and had really good seats but the lights were BLINDING! Now that i'm reading all of these comments i am really aggravated that they did not do anything to fix this yet! You can't even watch the stage because the lights are blinding, i had to watch the tv and the stage was so close! The music and pre-recorded videos were WAY TOO LOUD as well, i can agree with that. I was actually really disappointed this year there was a girl dancing (no clue who she was, she was amazing) but still, no one was ever introduced. I liked how they would introduce who was coming on stage, etc. but they rushed it this year people were coming on stage before the others were even off and i didnt like that. Honestly i thought last years show and the year prior were much better . I wholeheartedly agree. These "scientists" are showing their asses by removing Pluto's planetary status but then stating they found another "moon" orbiting it. From the Oxford Dictionary....Moon – "a natural satellite of any planet"
Moon is a misnomer in this case. Only Earth's satellite is called Moon. All others are just satellites. Moon is the proper name of our satellite. Look it up. When you talk about "moons" of other planets, you're misusing the scientific nomenclature. There is only one Moon, there are many satellites. Like Sun and star. There is only one Sun and it's the star that our planet, Earth, orbits. Also, Pluto is a planet... a dwarf planet. Good lord, the state of science education in this country...the word "moon" means a natural satellite. Our moon is named "Luna", you know, as in the word "Lunar". Any star can be called a sun, and our sun is named "Sol", hence the word solar. NASA rox! IAU, please reinstate Pluto as a full-fledged planet. Some humans are physically diminutive and travel in odd orbits too, but they are still human ! True, and some are made of ice and have no souls. Get over it. Pluto is a Kuyper Belt Object like thousands of others. It was misnamed when discovered. That has finally been resolved. Deal with it. No! DeGrasse was to quick in his assessment. What did poor little Pluto ever do to you? Pluto is a planet, I don't care what so called "experts" state. Also, it's fine time we sent a ship there to take some actual pictures of Pluto. Then you don't know the definition of the word 'planet'. Congrats on being willfully ignorant. Saw the show in Norfolk 23rd. Was blown away with wall-to-wall dancing. My seat was on the side, front row, so the lhtigs didn't bother me. Melanie was fabulous; a bundle of energy, & Sasha was awsome too. Truly those 2 gals are the hit of the entire season. Marko was missed & his fans all wish him a speedy recovery from the MCL injury. I agree with above ideas, to have an MC, or dancers to introduce the next act. Melanie takes your breath away when she makes her leap of faith . The schedule has jammed lots of cities in a very small window of time so the dancers are going to be worn to a frazzle by the end of the tour. How about next time you spread it out a lot more, giving the dancers more single days off, & thus be able to add more cities. This was my first live show. A few of the all stars in the mix would have been icing on the cake !!! Hats off to the group for all the high energy. A must see show !!! The planet formerly known as Pluto has evinced yet another moon. I'd like to see just one of these bully astronomers get off their armchairs and launch a mission to the planet they've been kicking to the curb. It's called "New Horizons" and it's on its way there right now. Did you not actually read the article or anything else about science in the past 6 years since it launched? Regardless, Pluto is STILL a "planet" no matter what a rigged vote of the IAU says. "The planet formerly known as Pluto"? It's still known as Pluto. It's the "planet" bit that they dropped. If you're just going to snark off from behind your keyboard, at least try to keep the facts straight. I don't know if anyone in a poistion of authority reads these comments, but I hope someone does.I would like you to consider the following idea.I realize extending the tour to add dates in the Pacific Northwest and elsewhere puts an additional physical burden on the dancers. So what about this idea: end the tour in November as planned, give the dancers some much needed time off (and rest), and then start it up again in January or February for an additional 12-15 stops.I have absolutely no doubt that any performances that are added will be sold out. Especially with Ovation Channel keeping interest in the show alive by rerunning Season's 6 and 7.I hope you will consider my idea.